I have been using a standing desk for just over 3 years now. It really all started when I moved into a small apartment and my old 8-foot corner desk I designed and built myself didn’t quite fit. While unpacking and rearranging the room for the third time, I leaned on a folding set of shelves and noticed that they were the perfect height for setting the laptop on and doing some work. I had two of these shelves…hmmm. An hour or so later my desk was a standing height and a functionless corner of the apartment became its home, taking up far less space than you would expect. 3 years later7 years later, and the benefits are stacking up. Below is a list of the benefits and drawbacks I have found while using a standing desk, daily. Let me say right up front that a standing desk is not akin to standing in line for hours. Once set up—and your co-workers have stopped coming by every 10 minutes to ask how it is—you will get focused on your work, not the standing. Lost 10 pounds the first month. No, really, I lost 10 pounds just standing there. It’s pretty easy to see how this happened in that my legs and core muscles are engaged the whole time. When sitting, they sort of turn off and hibernate. Lost 5 pounds the next month, and I now maintain a lower weight than I did while sitting all day. There is nothing in this world that will cut down your time-wasters quite like a standing desk. Even after three years, I know I am standing. So, for most, standing there and scanning Reddit for an hour or writing your 40th snarky comment on Facebook this morning is a thing of the past. Unless that is your job. A preview of our new office where every desk is electric-height adjustable. Desks shown are the Kimball Priority desk with Electric-Adjust Bases, as seen on page 17 & 18 of their brochure. ‘Eventually’ in that the first week or so will be spent getting your desk situated and learning the correct way to stand*. Then a couple weeks of getting used to standing. In the beginning, you may need to take numerous breaks throughout the day, like walking to the kitchen/lounge/slide, or sitting for a few minutes. Keep the sitting to only a few minutes, and try and do it away from your desk so that it doesn’t become a crutch while working. The goal is total transition. In the end, you should find that you are getting more work done than while sitting. Since standing, I have doubled my productivity. Yes, doubled. Not looking to coin a term here, but I can’t seem to find a better way of naming the collective time of getting in/out of your chair, plus the time you spend adjusting it periodically. If you were to add up the time it takes to get in and out of your chair, you will be astonished. Those ‘few seconds’ add up quickly over the months and can boost productivity. I estimate it takes 3-5 seconds to get in/out of a desk chair where it takes 1-2 seconds to get arrive at or leave a standing desk. How may times do you do this a day/month? While I love getting adjusted, I also love the fact that I feel like I need it less now than when I was sitting. My lower back has never felt better. And since I have an awesome chiropractor that is into preventative medicine, he likes the idea too. A standing desk is better for presenting your work to your art director or other individuals. In my field, having the art director over at your desk is pretty common. It gets cumbersome to drag another chair over, or have them hunch over to see the screen. In a small way, this can lead to them viewing the work in an uncomfortable way, and may affect their judgement of the work (I’m reaching, I know, but think about it.) At a standing desk I can have 3-4 people in close quarters and all viewing the screen at a more natural angle, and not at some bird’s eye view over my shoulder where the colors get all distorted. The cost of a standing desk varies, and depends on the setup required by the user, but can be less expensive for a few reasons: no chair, less chiropractic visits, and more employees in less space. For those requiring a hydraulically adjustable desk (sit and stand option), the cost can be quite high. In most cases, you can do a trial run where you get a box or podium and set it on top of your desk to try it out. My wife uses a $5 file storage box on top of her desk that places the laptop at the perfect height. It’s lo-fi, inexpensive, and not permanent. See LifeHacker’s “Standing Desks on the Cheap: The IKEA Guide” for more options. Keep in mind that if you go ‘total’ you don’t need a chair. There is $300 to $2000+ saved. Lastly, you may not need any additional furniture at all. Some cubicles have desks that hook into the wall like those cheap bookshelves. Just unhook it and move it up. Since many converts will eventually opt out of having a chair, the space taken up by the roll-in/roll-out area of a chair is no longer necessary. I’m not saying that you have users back to back, but the 4-6 feet typically required to facilitate getting in and out of a chair is now moot. 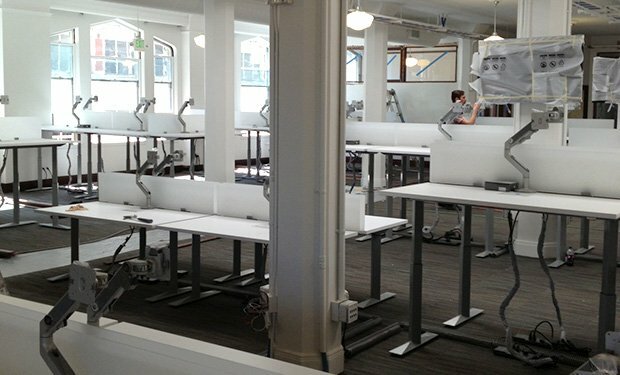 My estimate is that you can fit 25% or more employees in a space by using standing desks. Though, it is likely you will only gain this by having a standing desk ‘bullpen’ and not simply convert a few cubicles to standing desks. *I highly recommend you talk with a chiropractor or workspace ergonomics professional about how to stand at your new desk, and especially how to find the proper height of the work surface and keyboard. If you are in the San Francisco area, I recommend Rabbonni L. Tacusalme, DC at Axis Chiropractic. If you are going to transition from a sitting desk to a standing one, I believe it will be much faster to do it without a transition chair (or crutch chair.) Yes, your feet will hurt, and people that wear high heels or uncomfortable and unsupportive shoes may suffer a bit. If you can kick them off and stand without shoes, all the better. You’ll get used to it – anyone that has held a retail job (or six) will get used to it faster. Get a friend and a tape measure. Be sure you are wearing the shoes you wear while working. Stand up straight and natural, like you would every day. With your arms to your sides, bring your hands up in front of you—while leaving your elbows at your sides—until your hands and your elbows are at the same height from the floor (basically, an L-shape). Have someone measure from the bottom of your elbow to the floor. If you are planning on a flat desk, this is the height it needs to be. If you use a thick, ergonomic keyboard, minus 2 inches for it so your hands do not go above your elbows. Basically, your desk height + the height of your keyboard/laptop should be at or just below your elbow. And be sure to take your shoes into account. I prefer to stand on wood without shoes, but you may find a mat or walking shoes to be a better option. The thickness of your shoes’ soles will matter in the height of your desk. In some situations, the person across from you, or next to you, may not be excited about a person looming over them. Even at 4 feet away, it can feel odd to some. Maybe they get used to it; maybe not. But, you should consider those around you. A great way to ensure you stick to it is to get a few of you to do it together, and be near each other. Either way, ask those around you before you start to build or modify your desk. If you are in an office where your boss is in a wheelchair or cannot stand for any length of time, building a standing desk can be awkward. Especially if your job has them over at your desk often to review work on your screen. Think about it first, talk with them and work something out. Just don’t use it to alienate people. I am interested in hearing from you about what you find as a benefit / drawback to using a standing desk. Feel free to add them below or email me. I have used a treadmill desk before my treadmill blew up :). Now I have raised my desk and and standing on a rebounder which gives me alot of movement during the day and is soft to stand on. I love it! The rebounder sounds fun, but I have no idea how I would ever get any work done while doing backflips. 🙂 So, I just use mine while on the phone. I’ve got an Indo Board and low-profile cushion that I need to start using while standing. But, I am waiting for our new office where rumor has it we are getting electric-adjustable desks. My Ikea coffee table setup doesn’t play well with the height changes of the fun things I want to stand on. No drawbacks here as it’s a smaller office. People ask to use my desk when I’m not using it! Thinking of adding 1 or 2 more treadmill desks in the office for anyone’s use. Probably need a sign-up sheet! Hey Tristan, how exactly did you measure productivity? Yes, I did say “Since standing, I have doubled my productivity.” And it still holds true to this day. How did I measure it? As per Wikipedia, “The measure of productivity is defined as a total output per one unit of a total input.” So, when I started to find that I was spending only 5 mins on Facebook instead of an hour (among other time-wasting activities), and that I was getting the same amount of work completed in 4 work hours instead of eight, it led me to believe that my productivity doubled. I recently spent 3 months in a chair-bound desk, and after the first 2 weeks I noticed my time-wasters came back and I was creeping back up to ‘needing’ 8 hours to do what I used to do in 4. Back to a standing deal and I am back to being very productive. In short, I estimated my boost to productivity. Obviously, others’ results will vary. The reason why I was asking was because I’m wanting to trial a standing desk in the office and being able to show that it leads to increased productivity is definitely a positive. I’ve found an application that does exactly what you’re saying, except in more specific quantitative terms. We liked the standing desks that we made for ourselves so much that we started to sell them to others. Personally, while my heels do get a little sore, my back pain has been greatly reduced and I feel more energetic. I am on my 4th day of a standing desk. Still getting used to it – it seems to tire my calves a bit which kind of surpised me since I’m a runner/hiker/biker and just bought a horse! I’m going to date myself here, years and years ago it was the big thing that standing all day was so bad for you, ruined your feet and legs, was the cause of vericose veins, etc. Then rubber mats started appearing for peopole to stand on and now the anti-fatigue mats that we all have in our homes! Now of course it is how bad sitting all day is for you. While I agree that sitting for 8 hrs is not good for you (I know how it affected me) I have to wonder if standing for 8 or more hours doesn’t have some draw backs health wise. Does anybody do any kind of periodic stretching just to give your feet and legs some relief? Anybody have any suggestions? Glad to hear you are trying a standing desk. It’s not for everyone, but everyone should try it. I think doing anything for 8 hours straight is bad. Sitting, standing, stamping metal, bending at the waist, whatever it is 8 hours will take its toll on you. I recommend taking sitting breaks from time to time, as needed. I highly recommend walking too, and people should consider walking meetings to break up the day. Chiropractor suggested using a 2×4 to raise my toes and stretch out my calves occasionally throughout the day. That helped keep my calves/hamstrings from getting too tight from standing. You can also consider a few standing yoga poses or runner stretches. Set a timer to go off ever 30 mins and do a 1-2 min stretch routine or walk around the office. As for the anti-fatigue pads… I prefer standing on a piece of sturdy, flat pine. I find soft materials (shoes, mats, carpet) tend to make my arches and metatarsals ache. Some people consider the standing desks beneficial but some do not. After reading this post, they will come to know that there are more benefits as compared to drawbacks. I have had one day on the standing desk and I my calves were on fire and spasms shot thru them. I thought I must be doing something wrong….I guess that shows how out of condition I am. I am not giving up, I will trying everything, because I do not want to sit all day. I plan on stretching and taking it very slow until my calves can get used to it. Any suggestions out there? Thanks for letting us know how it is going for you. I would say that you are probably not the only one experiencing pain and discomfort making the transition from sitting all day to standing. I HIGHLY recommend that if you have been sitting at a desk for years that you consider a slow transition. I’d expect it to take a few weeks. As with anything, jumping into the deep end can be tough. Try standing for three 30-minute periods: morning, around lunch, and before you leave work. Then when before it starts to get easy, add another 30-minute period, or increase them to an hour each, depending on how it’s going, until you are standing for most of the day. Lastly, stretching will help alleviate the pain and muscle soreness. For awhile I had a block of wood under my desk that I used to help do a calf stretch (a yoga block can help work too.) Look up yoga and stretching exercises to do at your desk—there are tons of articles on it now. Also, you may need to try different shoes and insoles to help. Soft shoes don’t work for me, but may help you. Hope this helps. I have been standing at my desk,sewing table since I was 13 years old. I’m pushing 60 now. The health benefits are good but as you age you will need to make adjustments. Keep a comfy chair handy. Lots of benefits for using stand up desks. Standing regularly is shown to improve metabolism greatly over sitting. Keeping fit with a stand up desk will come automatically.